Following is the declaration of the Minister of Communication, René Emmanuel Sadi during a press briefing in Yaounde on January 26, 2019 in the presence of the Minister of Territorial Administration, Paul Atanga Nji. "The political party called Cameroon Renaissance Movement (CRM) planned to stage a series of unauthorized public demonstrations called "white marches" throughout the national territory, including the ten regional chief towns, as well as in some foreign countries around the world. Through these demonstrations, the CRM intended, as usual, to push our compatriots at home and abroad to defy the republican order with slogans of rebellion and insurgency against legal and legitimate institutions. The announced date for the launch of these demonstrations was set for Saturday, January 26, 2019. It should be noted that all over the national territory, Cameroonians went about their business throughout the day in all serenity. Nevertheless, some attempts to disrupt public order and defy republican institutions were recorded in the towns of Mbouda, Bafoussam, Yaoundé and Douala. After making a fair judgment of the situation, the Administrative Authorities took the necessary security measures to preserve public order and bring the sponsors back into compliance with the laws and regulations of the Republic. In Yaoundé, Bafoussam and Mbouda, se veral individuals caught in flagrante delicto disrupting public order and perpetrating various assaults were arrested and placed in custody: 62 in Yaoundé, 42 in Bafoussam and 13 in Mbouda. 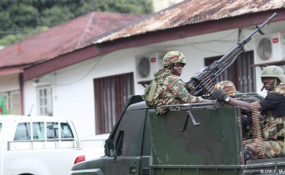 In Douala, the forces of law and order were positioned at certain key points of the town. Some participants in this illegal march organized themselves in a particularly aggressive manner and took upon themselves to face and challenge the Security Forces in the execution of their traditional missions of preserving public order. Showcasing restraint and professionalism, the forces of law and order went on to issue formal warnings that were unfortunately not followed by the demonstrators. This led to a few clashes during which the security elements made use of regulatory logistics. It should be made clear, on the basis of facts of absolute truth, that no live ammunition was fired. Seven people were arrested and brought back to the headquarters of the CRM, at "New Deïdo" in Douala I Subdivision. In addition, six persons were slightly injured, including two well-known activists. Abroad, a hundred of CRM militants attacked Cameroon's Embassy in Paris, France. After scaling the fence of the building hosting the Embassy, they broke into the offices and ransacked everything on their way, causing huge damages. As we speak, these individuals have been taken out of the premises by the French forces of law and order. The Government strongly condemns these unacceptable manœuvres to destabilize Cameroon under the false pretext of an alleged "electoral hold-up". Let us recall that Cameroon is and remains a rule of law where the devolution of power is done through the ballot box and not through violence or street demonstrations. The Government therefore warns those who persist in making ungrounded claims which barely conceal their dark intentions, and reminds them that they shall be held accountable for the consequences of the exactions committed and liable to the sanctions provided for by the law. The Government avails itself of this op portunity to appeal to the sense of responsibility, patriotism and civic spirit of the populations, our fellow citizens of the diaspora, and especially youths, not to yield to manipulation by political leaders of bad faith who are blinded by intemperate and reckless ambitions. At a time when Cameroon is resolutely moving towards its emergence, everything must and will be done to preserve peace and stability. Thank you for your kind attention".